eBay This listing is for physical software not a download offer. Pictures are actual pictures.Xbox 360 game will download to Xbox One console. Internet connection is required. Note: The promo code maybe included as part of the original packaging, but the DLC offer may no longer be valid and expired. Product Description Modern Warfare is back. On November 8th, the best-selling first person action series of all-time returns with the epic sequel to the multiple Game of the Year award winner Call of Duty: Modern Warfare 2. Call of Duty: Modern Warfare 3 is First-person Shooter rooted in a fictional, but ultra realistic near-future conflict of mostly American forces with those of the Russian Federation around the globe. 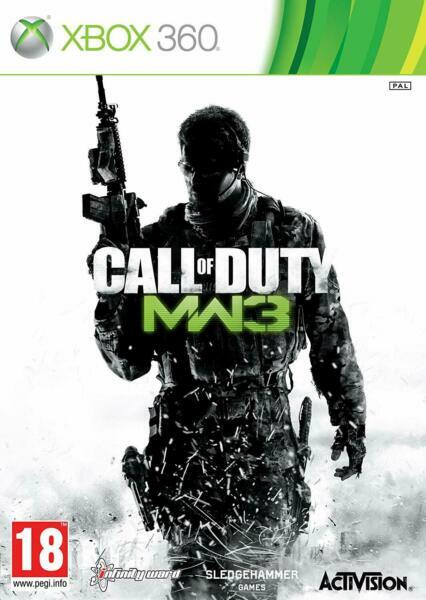 The third installment in the Modern Warfare branch of the Call of Duty franchise, Modern Warfare 3 features a heavy focus on multiplayer gameplay which includes innovative new functionality that encourages multiple gameplay combat strategies, a new 2-player co-op option, new play modes, weapons and more. The game also includes a gripping single player campaign that picks up where Call of Duty: Modern Warfare 2 left off, and game integration with the Call of Duty: Elite online service. Do What is Necessary in the Face of Invasion Call of Duty: Modern Warfare 3 is a direct sequel to the previous game in the series, Call of Duty: Modern Warfare 2. In the game's single player campaign Russian Ultranationalist Vladimir Makarov continues his manipulation of Russian Federation forces in their invasion of the United States and Europe. In their way stands characters like Task Force 141 Captain John "Soap" MacTavish, former SAS Captain John Price as well as new playable characters from Delta Force and the British SAS. Engage enemy forces in New York, Paris, Berlin and other attack sites across the globe. The world stands on the brink, and Makarov is intent on bringing civilization to its knees. In this darkest hour, are you willing to do what is necessary. Multiplayer That is Bigger and Better Than Ever Call of Duty: Modern Warfare 3 delivers a multiplayer experience that continues to raise the bar by focusing on fast-paced, gun-on-gun combat, along with innovative features that support and enhance a large variety of play-styles. Now, you can truly define your approach with a toolkit more expansive than any previous title. Continue the Call of Duty: Modern Warfare in the third release in the series. Best in class multiplayer action. Pointstreaks and Strike Packages Killstreaks, benefits and abilities awarded for stringing together multiple kills, have been transformed into Pointstreaks, creating a system that rewards players both for landing kills and completing objectives. These rewards have been broken up into three different categories, known as Strike Packages: Assault - Pointstreaks within this package chain together and deal direct damage. It includes classics like the Predator Missile and Attack Helicopter. Your streak resets on death.Support - Pointstreaks within this package do not chain, focusing instead on surveillance and disruption. Your streak does not reset on death meaning they will respawn with you. Specialist - Pointstreaks within this package are designed for advanced players. Rewards come in the form of additional perks for optimal performance. These perks last until death. Weapon Proficiencies Just like your player, weapons now rank up, unlocking additional attachments, reticules, camos and the new proficiency category. Weapon Proficiencies not only allow you to get better with weapons, they also allow you customize your weapons with helpful attributes such as "Kick" for reduced recoil, "Impact" for deeper penetration through hard surfaces and much more. Many proficiencies are specific to their weapons class. And all are geared towards enhancing a certain play style and can allow for efficient use of your favorite weapons in maps and game modes in which they might not otherwise be the best choice. Modes and Match Customization Along with the return of the fan favorites Call of Duty: Modern Warfare 3 introduces several new game modes. Collect dog tags from killed players, including those on your squad while you prevent the opposing squad from taking yours in Kill Confirmed mode. In Team Defender mode, grab the flag and protect the flag carrier for as long as you can to increase your team's score. In addition players will enjoy user generated match mode functionality which allows you to configure any mode how you want it and then share these over the Call of Duty: Elite online service. 2-player Co-op Special Ops Survival Mode Special Ops cooperative action returns with a bevy of additions, including 16 new objective-based missions and the all-new Survival Mode. Team up online, locally, or play solo and face endless waves of attacking enemies throughout every multiplayer map. Purchase and customize your weapons, air support, equipment and abilities to stand up against increasingly difficult forces and land a spot on the leaderboards. Earn experience and rank up with the newly implemented progression system. The higher the rank, the more weapons, air support, and gear armories you will have available to customize so you can change your tactics on the fly. In addition to the action packed battle for freedom, the cooperative Survival Mode also serves as an effective training tool for competitive multiplayer action. Call of Duty: Elite Call of Duty: Elite is an online multiplayer oriented service launched simultaneously with Call of Duty: Modern Warfare 3. The service offers both free and subscription based levels of access and is dedicated to the game franchise, featuring lifetime statistics across multiple games, social-networking options, competitions, a mobile app, Facebook integration and more. Please NOTE: This game is UK Import Game it is Region Free PAL Game. HD TV and HDMI Cable connection may be required to play.